Review by Nathan on 8/29/2013. I love this map, especially the Air island. The connections there make gameplay very interesting and fast-paced. The bonus sizes are manageable and I like how the superbonuses are distributed. My only structural suggestion would be to make the central region more interesting geographically - perhaps you could add dividers so that you have a central hub and six separate compartments that funnel into the center. I would also like to see more inventive names of territories and bonus areas. For example, the fire island could have territories such as "Inferno" or "Conflagration". Review by Byuu on 8/31/2013. Review by indiman112 on 8/18/2014. Fun map! Rough start but hang in there and you will prevail. A fun map if you want a bit of variety over the standard hexagon maps. Review by Y.N.K.H on 9/8/2013. Review by Damion Strife on 10/18/2014. Now this is fun, win or not ! Review by Cade on 2/21/2016. Review by A_B3 on 7/23/2017. 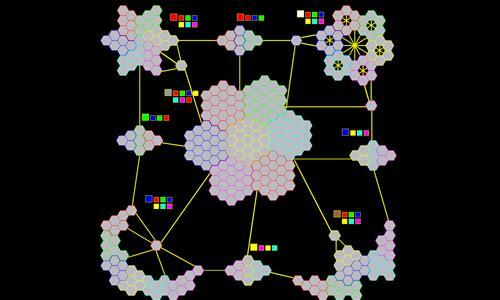 Hexagon games are painfully challenging as most blocks have up to six connections. Enjoyable. Review by BloodBath185 on 8/31/2013.